430 pages | 21 B/W Illus. This state-of-the-art volume provides insight into the recent developments in survey research. It covers topics like: survey modes and response effects, bio indicators and paradata, interviewer and survey error, mixed-mode panels, sensitive questions, conducting web surveys and access panels, coping with non-response, and handling missing data. The authors are leading scientists in the field, and discuss the latest methods and challenges with respect to these topics. Each of the book’s eight parts starts with a brief chapter that provides an historical context along with an overview of today’s most critical survey methods. Chapters in the sections focus on research applications in practice and discuss results from field studies. As such, the book will help researchers design surveys according to today’s best practices. The book’s website www.survey-methodology.de provides additional information, statistical analyses, tables and figures. 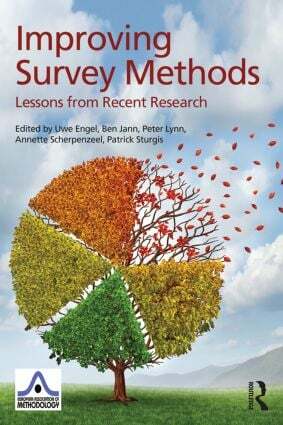 An indispensable reference for practicing researchers and methodologists or any professional who uses surveys in their work, this book also serves as a supplement for graduate or upper level-undergraduate courses on survey methods taught in psychology, sociology, education, economics, and business. Although the book focuses on European findings, all of the research is discussed with reference to the entire survey-methodology area, including the US. As such, the insights in this book will apply to surveys conducted around the world. Uwe Engel is Professor of Sociology at the University of Bremen, Germany. Ben Jann is Associate Professor for Sociology at the University of Bern, Switzerland. Peter Lynn is Professor of Survey Methodology at the University of Essex, UK. Annette Scherpenzeel is the cohort manager of the Consortium of Individual Development at Utrecht University, the Netherlands. Patrick Sturgis is Professor of Research Methodology at the University of Southampton, UK. a timeline including planned completion date and projected length of the manuscript. e.davidov@uni-koeln.de),or by visiting the European Association of Methodology website at http://www.eam-online.org/.